Today, it is not unfamiliar to feel a constant oscillation between the eastern and western ideas of culture with the world’s expedited methods of communication, but this was occurring at a frequent rate centuries ago, as well. The term eastern may typically presume an Asian context, particularly Chinese or Japanese; however, it also includes the Near East. 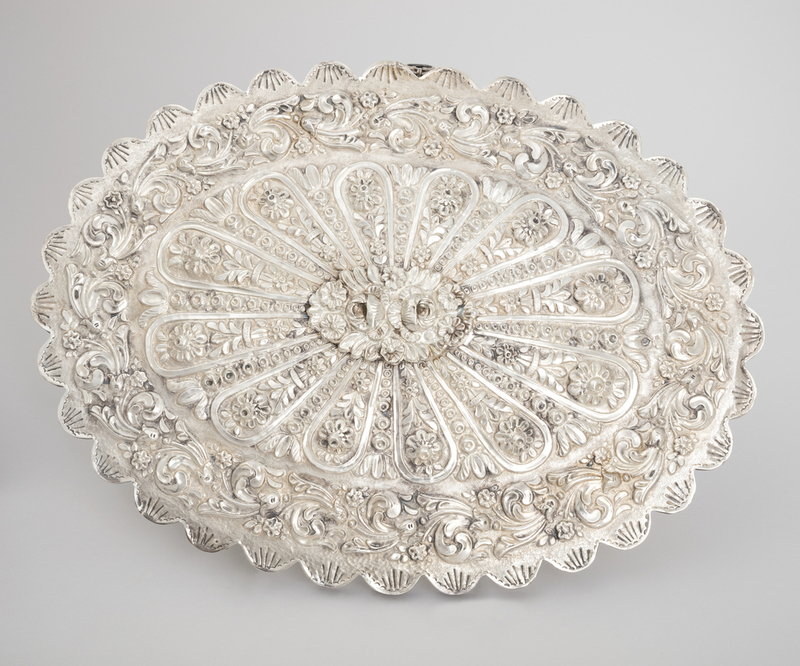 The Ottoman Empire, more specifically Turkey, brings us one of the most unusual mirrors in Cooper Hewitt’s collection. At once, the mirror adapts to western modes of ornament while adhering to traditional craft and design of Turkey. This mirror brings up questions of function, as most mirrors we experience on a daily basis function as a reflective surface for the purpose of examining oneself. Mirrors also function decoratively, which could arguably be this mirror’s primary concern. Although some schematic elements typical of design of the Near East arrange the space on the back of the mirror, there are rococo-like vegetal arrangements showing a clear western influence. Most examples of mirrors in the collection display their ornament through their frame, and some through engraving on mirrored glass, which makes the Turkish mirror stand out. The two examples of Turkish mirrors in the collection have ornamentation on what is typically considered the backside of the mirror, which begs the question: which side is for display? There is a hook affixed at the top of the mirror indicating that it could be hung. Should one hang the piece would the mirror face the wall or outwards? Keeping the mirror facing the wall when not in use may have some roots in superstition but the mirror could also be decorated extensively so it could be kept on a stand on a dressing table, which was a common piece of furniture in western culture during the Victorian period.